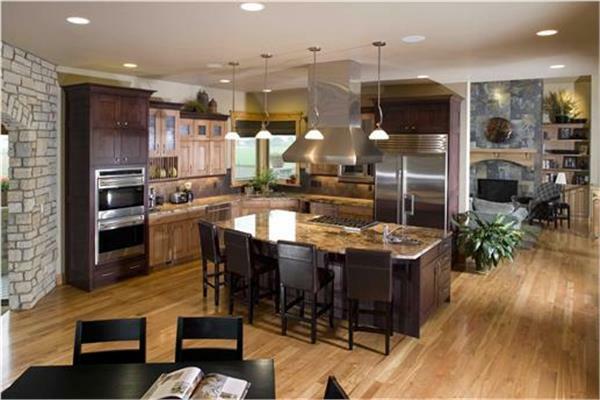 House plans with great -- and large -- kitchens are especially popular with homeowners today. Those who do the cooking are looking for the perfect traffic pattern between the sink, refrigerator, and stove. Those families that spend most of their time in and around the kitchen, are moving towards open floor plan designs which connect the kitchen, dining and family areas. This design is also gaining popularity among those who enjoy entertaining with friends. Within the kitchen itself, many popular designs feature kitchen islands or breakfast bars. Other designs offer extensive cabinets, walk in pantries or even closets for extra storage space. Some even offer outdoor kitchens or "grilling rooms". The list of home features for kitchens can seem endless!